Also available from numerous download stores. 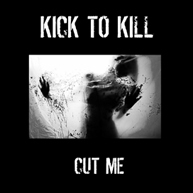 Cut Me will also appear on the forthcoming debut album from Kick To Kill. The band’s debut single (‘Quit Tomorrow’) was hailed in 2007 as “the single best song I’ve heard from a Scottish group in a very long time” (Heaven Or Las Vegas) while Jim Gellatly described Kick To Kill as “a band that lives up to it’s hype… Really phenomenal” on his XFM show. The band’s original line up disintegrated within days of the single release, leaving the essential core of Dave Cook, Harris Hill and Lewis Macaulay. The past 2 years have been colourful to say the least. The whistlestop history tour goes like this. In 2007 the band, along with Flowers In The Dustbin, created the seminal Glasgow live event The Darkwave Opera. The event has played to packed audiences in venues including Barfly, The 13th Note, The Captain’s Rest and The Beat Club. Legendary support slots have included sold out nights with The Fall, John Cooper Clarke and A Place To Bury Strangers. The band were also selected by The Damned to play on their Twisted Cabaret tour. Fast forward to now and Kick To Kill are back with a new fourth member, Ewen Shearer, and the purest, aggressive, nihilistic rock’n’roll you’re likely to hear this side of Funhouse era Stooges. This band is indestructible. Listen. Believe. The first track to emerge from the dark is Cut Me which will be available Monday 2nd November as a download from itunes and all major download stores. Cut Me was engineered and mixed by Dave and Iain Cook (Aerogramme, Twilight Sad).